The Amazon Echo is a smart speaker first released by Amazon on November 6, 2014. The Echo is a digital assistant that can interact with a user using voice recognition and answer questions, set timers, control other smart home devices, and perform hundreds of other skills. Once the wake word is said, the Echo will light up to indicate it is ready for a question or other request. You can then ask a question or a request. For example, you could ask “What is the current temperature?” to get the current temperature in your area. You can also interact with an Echo using the button on the top of the device or with the Alexa app on your smartphone. The Amazon Echo has thousands of different capabilities known as skills and allows anyone to add their own skill. Below are just a few examples of the skills the Amazon Echo is capable of doing. Set alarms, timers, and reminders. Get information about the weather. Play a song or a genre of music from Amazon’s music service. Tip: You can see a complete listing of Alexa skills on the Amazon Alexa skills page. One of the biggest privacy concerns that some people have with the Amazon Echo is that it is always listening in their home. However, Amazon assures people that the Amazon Echo only sends audio it hears to Amazon once the wake word has been said. So, anything that is heard when the device is not active is not recorded or sent to anyone. Tip: The Echo devices have mute buttons that can be pressed to mute the microphone from listening or recording any audio. However, if enabled, it will not be able to hear the wake word. Recordings that have been made after the wake word has been said can be listened to and managed through the Alexa smartphone app. 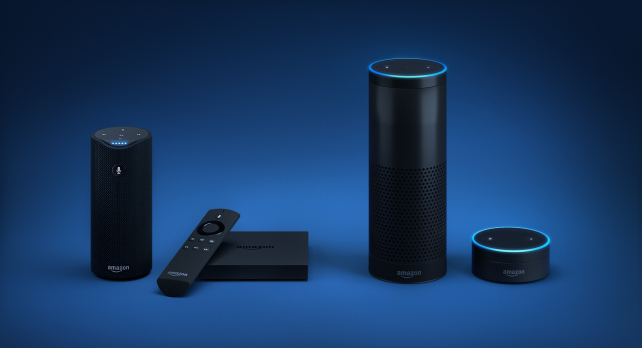 Since its release, there have been many additional versions of the Amazon Echo. Below is a brief description of each of the different versions of the Echo available from Amazon. Amazon Echo – The first edition of the Amazon Echo was a 9.25″ tall cylinder speaker. Amazon Echo Dot – The first Echo Dot was introduced in March 2016 and is a device that is about the size of a hockey puck. The Echo Dot is capable of doing everything the original Echo was capable of doing at a fraction of the cost. Amazon Echo Look – The Echo Look was introduced in April 2017 and included a built-in camera. The camera added the ability to take photos and videos and included the ability to offer fashion advice. Amazon Echo Show – The first Echo Show was introduced in May 2017 and included a 7-inch screen with a 5 MP camera. The screen allowed for additional information to be shown, play videos, and for users to make video calls. The second edition released on September 20, 2018, had a bigger 10-inch screen and improved speakers. Amazon Echo Spot – Introduced on September 27, 2017, the Echo Spot is an Echo with a 2.5-inch circular screen that resembles an alarm clock. Amazon Echo Plus – The Echo Plus was released on September 27, 2017, and included the additional capability of connecting wireless smart devices in a home and an improved noise cancellation microphone. The second version of the Echo Plus released in September 2018 had all the same capabilities with a temperature sensor. Amazon Echo Auto – The Echo Auto is a device for cars that connects your smartphone to your car over Bluetooth and allows you to interact with the Echo in your car. Amazon Echo Input – The Echo Input is a small device that connects to a speaker of your choice to provide audio output. Amazon Echo Link – An improved version to the Echo Input, the Echo Link has additional output ports and a volume knob to control the audio level. Amazon Echo Link Amp – A version of the Echo Link with a built-in amplifier. Amazon Echo Sub – The Echo Sub is a subwoofer that connects to other speakers to allow the user to have an improved audio experience when listening to music through the Echo. Previous Previous post: Say ‘Hello’ to Google Assistant !